If you are selling anything online you will need to have the ability to accept credit card payments from your site. To make this process easy for our customers we've partnered with e-onlinedata, an online payment industry leader, to offer unparalleled service at attractive rates. Hundreds of our customers are already processing payments today with e-onlinedata or are switching to take advantage our exclusive offer. We think you'll agree that e-onlinedata is an obvious choice when it comes to price and reliability. If you are already a customer and would like to take advantage of this exclusive offer, you can get started by filling out the form above. If you have not signed up for your ecommerce account yet, go to our signup form where you can take advantage of this offer at the same time. Once your application has been approved, we will send you some simple instructions on how to begin accepting credit cards on your shopping cart using e-onlinedata and the Authorize.Net payment gateway. You'll be up and running in no time. For more information please contact our Merchant Account Specialists at 877-238-3063 or simply fill out the form above. 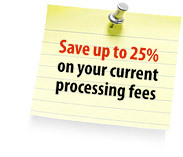 You could save up to 25% on your current processing fees simply by switching to e-onlinedata. Call 877-238-3063 today to speak to one of our Pricing Specialists about a FREE Savings Analysis.